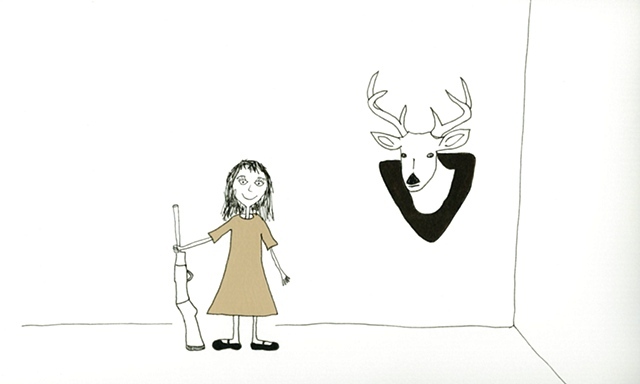 For several years I have been focused on an ongoing body of work using drawing and printmaking involving a little girl who does bad things. The narratives in this body of work are not based on real life experiences, but on a fictional child who has no conscience. I moved into the three dimensional realm first with deformed dolls constructed from found fabric and buttons, and monsters made out of polymer clay. These creatures act as the confidants to the little girl in the drawings; much like other children who tell their secrets to teddy bears, the little girl shares her evil plots with the dolls, malformed from the pernicious stories they retain within. I am enthusiastic about the border blur in my practice among materials and media - from traditional drawing and printmaking through wearable art and traditional clothing. I use my printmaking skills to silkscreened some of my drawings onto clothing. I have been involved in a few local craft/artists sales selling the clothing, and other jewelry items I make. I have been selling them at Funktional, a locally owned store in downtown Kelowna. I also I started making the monster dolls smaller and with pins so they could be fastened to peoples clothing, into something that could be considered wearable art.